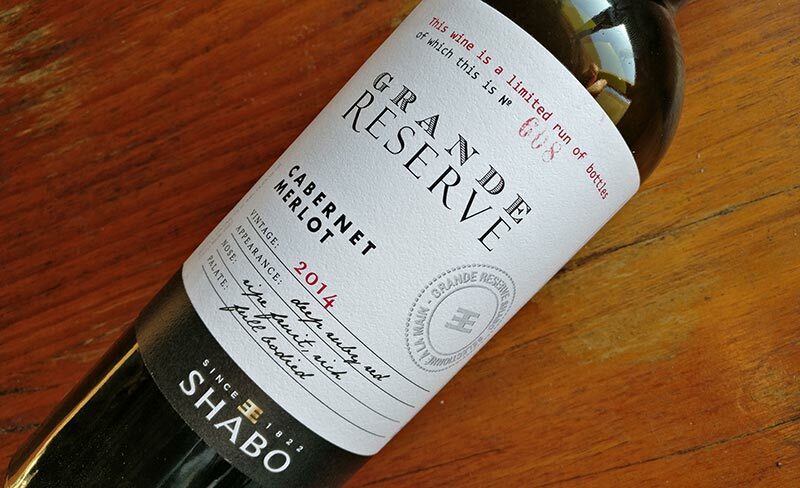 Shabo – Grand Reserve Cabernet Merlot 2014. Yes, Ukrainian wine. When returning from my recent trip to visit Armenian wineries, I had a layover in Kiev’s Boryspil Airport and despite reliable free wifi, there wasn’t much to do but wander around, eat a damned fine cheesecake, and browse duty free including what turned out to be a good booze shop. Naturally, this being part of the former Soviet Union, the Vodka selection was beyond reproach, including bottles that were cheaper than actual water! But behind the Vodkopolis there was the wine section including yes, Ukrainian wine. The thought may strike people as odd in a “who woulda thunk it?” kind of way, but surprisingly, it was Ukraine, not Georgia that was the biggest supplier of wines during Soviet times. Or, so the figures seem to state as finding out much on Ukrainian wine is tricky. There’s not much beyond articles talking about how the annexation by Russia of Crimea stole a huge chunk of what was Ukrainian wine production, especially with the historic Massandra winery. As a side note, on my last trip to Georgia, some Russians I met pulled a bottle out of their cellar from Crimea and indeed, it is now written, “Product of Russia” on the label. Ridiculous. But, the wine I ended up buying was a seemingly “top-end” offer from Shabo. For anyone who has spent any time in Ukraine, Shabo is one of the more dominant wine brands produced in the country, located in the Odessa Oblast. Naturally some people would probably think, “Wha? But it gets too cold there for viticulture.” Actually, it doesn’t as there’s a heavy influence of the Black Sea and this is right next to Moldova where most in the “wine curious” circles should know that a great deal of wine is produced. Latitude-wise you’re looking at a region that’s about the same as Northern Rhône in France. Given that, it’s a surprise to see them working with Cabernet Sauvignon, Merlot, and Saperavi instead of Syrah and Viognier, but the Chardonnay would seem more or less at home. Most probably, their variety choices are based more on market reach than what may be the most suitable for the region. Even still, there seems to be part of the company concerned about quality as, since December 2012, they sit in the only PDO appellation that exists in Ukraine so far. I’ll be damned if I can find the actual name for it as it either appears to be ‘Transcarpathia’ or then is a PDO for all of ‘Ukraine’. Once everyone gets over yabbing about how it’s ‘the first!’, maybe the truth will surface some day. As to the wine itself, I was generally surprised. I truly didn’t know what to expect as I’m sure a great wealth of the winery’s production is either Semi Dry/Sweet or then Sparkling given what the majority of the wine drinkers in the former Soviet Union (minus the Georgians) prefer. As a proper dry wine, it ticks off all the boxes quite well. It is not however a terribly deep or involving wine, but I’m going to warrant that had more to do with the scabby 2014 harvest across Europe than anything else. It’s quite clear that whomever is in charge of the winemaking has studied well, but when this shortened maturation period came due to rain (at least in Western Europe) they tried to balance it out with a heavier oak regimen and maybe some stems to give it body. It also feels that there may be some alcohol added as well given that if the 2014 premise plays out, then 14.6% would have been a stretch to reach. The label makes reference to ’12 months’ in oak and that they use ‘supermodern equipment’ but short of that, I’m just making educated guesses. Overall, I wasn’t let down although I found the price to be a bit high. At any rate, I’ll give Ukrainian wine another chance whenever the opportunity arises! Dark ruby with light ruby crest. Plum, black olive, sage, tomato skin aromas initially. With air, green pepper emerges but also a minor touch of earthy iron. Medium acidity, barrel notes more prevalent on the palate, possibly mix of mostly used and some new oak, alcohol medium plus and detected much more in the finish with a bit of nail polish aspect. Could do with a bit more aging to integrate but the acidity is going to taper off and leave it a bit hollow with time.